As a new school year approaches, education again becomes a favorite topic of discussion in newspapers, on television, in community gatherings, and everywhere people "talk". "What’s wrong with…. ", "They should….."and " Why don’t they…." Are popular sentence openers. This year is no exception. U.S NEWS AND WORLD REPORT ("Crisis In Education"), TIME, and NEWSWEEK, plus the LOS ANGELES TIMES have been very "active" in August. Also, the RISE Commission report has just been received. Therefore, we shall be asked what we’re doing and why perhaps more this year than in the past. We cannot escape accountability. Our methods, personalities, and this total scope of things will be examined. Often as we look to the future, it is valuable to look back to where we’ve been. To plant roots in past experiences can be supportive. It is the purpose of the following to give all of us a chance to become a little more closely acquainted with the heritage of our district and particularly our school. 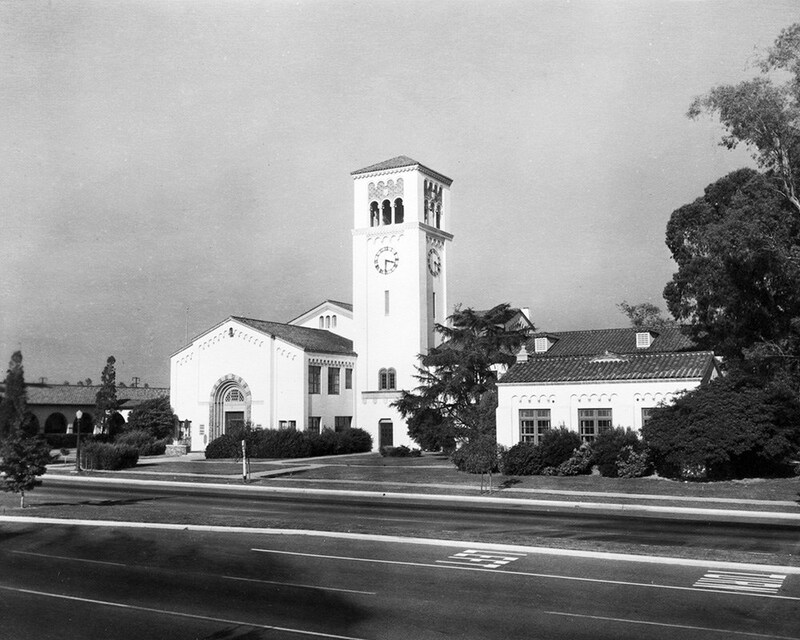 In an article in memory of John Alman, High School principal, the SOUTH PASADENA REVIEW (May 17, 1940) stated – "Communities having the advantages that distinguish South Pasadena and San Marino do not arrive by accident. There is a clear reason for the existence of these advantages. In times past there must have been anxious, judicious planning by men who had the vision of a community without saloons, a neighborhood of homes where womanhood and children would be safe. . . in an atmosphere of progress, cleanliness, beauty and culture. So, while they planted trees, laid out streets, they built excellent churches and superior schools to develop a citizenship with those qualities that make for physical, mental, moral and spiritual vigor." The people of South Pasadena indeed felt education was important. So important that by 1886, the South Pasadena School District had been formed and El Centro school was built. ($1,550 cost – including bell and outhouse, $10.) Bonds were floated, land purchased, and plans were made. By 1904, a high school was planned so that students would not have to go to Los Angeles or Pasadena. With 32 students, the first high school class met in Center Street School on September 18, 1905 and in April 1906, a six-acre tract was purchased for $15,000 for construction of a high school. With the exception of two years, 1905-1907 when Noble Harter was Elementary Principal and Superintendent, George Bush was the superintendent during the district’s growth, development, and rebuilding program until 1940. An important goal of our district was established early. Of the six graduates from high school in 1907, four went to college. Those students graduating between 1907-1910 totaled 54, 37 of those students went to college. Salaries for teachers in 1910-1911 for the district totaled $11,090.00 for 12-20 teachers. An increase from $55.00 to $85.00 a month grew through the years until 1910. Also, there was a $50.00 bonus awarded at the end of a school year per teacher. (Janitor supplies totaled $30.50 for the school year). By 1919, George Bush was calling for the establishment of an intermediate school in the district. In addition, he wanted the establishment of an "Opportunity Room" at the high school, to be "ungraded" and to give an opportunity to those students who might otherwise leave school. In 1924, bonds were passed to make money available to purchase the site for a junior high school. The town then waited for the population to grow which would necessitate construction. In 1927, $555,000 was budgeted for erection and equipping of an appropriate junior high school. Also purchased was a site in San Marino to service "that part of the district with a junior high school". (B) A beautiful building located on a principal thoroughfare would be of greatest value in advertising to the world the educational advantages of the city and progressiveness of the community. The architects were then challenged to make S P J H S the most beautiful school in Southern California. If this was achieved, they felt it would be the most beautiful in the country. In mid-January, 1928 the ground was broken for the Junior high school with the promise by the builders that it would be turned over August 25, of the same year. At a cost of $480,000 the buildings were equipped and completed so that school opened on September 10-on schedule. (1) Auditorium acoustics were based on the formula of the leading acoustical person at the time-Dr. Watson-who inspected the auditorium and stated it was excellent. (2) The present El Centro school was opened at the same time as the junior high school. (3) An outdoor convocation opened the junior high school. (4) Gym and shops- cost $60,000- with equipment costing $40,000 more. (5) Athletic field-formerly a nursery- cost $10,000 including landscaping. While the curriculum was strong and broad, the school building was to serve as a learning tool as well. The cloistered arcades and total environment was to be one of learning. The students and community as well as the staff became involved in beautification of the grounds. In April 1929, the PTA planted three oak trees in the patio in the rear of the junior high auditorium. These were to serve as a memorial to the first association at the junior high. The planting ceremony was quite a program with a play by students, community members attending the business meeting, readings and chorus offerings, followed by a social hour and tea. The three oaks still stand (near the bicycle rack). (1) Pictures by the auditorium entrance which were painted in 1934 by Horman Chamberlain and depict Indians at a feast ("Indian Ceremonial"). (2) The auditorium mural over the stage was painted in 1928 by Lucille Lloyd. It is called "Madonna of the Covered Wagon" and depicts the close of day in the Yosemite Valley. (3) The students created murals and frescoes, which were beautiful and plentiful. A library tapestry was created in 1931-32 by art students depicting life in the Middle Ages. This could not withstand the cleaning in 1967 and was destroyed. Many of the art works were on the walls of the buildings and were destroyed as the various building programs developed. (4) Still with us are etchings of George Washington, Abraham Lincoln, and Alexander Hamilton presented in 1929 by the Daughters of the American Revolution. (5) "Instruments for the Wind" – now in the office – was by Mildred Brooks and was presented in 1944. (6) "St. Francis of Assisi" was presented in 1944. It is the work of Merrell Gage, Los Angeles sculptor. The walnut pedestal and triptych were designed by Mrs. Gwen Padem and constructed by Mr. Bert Rightmar, instructor in wood shop at the time. The occasion for its presentation was the retirement of Mrs. Edna Lembka who taught English and Social Studies for 1927-1944. (7) The Bas Relief at the south entrance to the auditorium is a Works Projects Administration product by Donal Hord showing recreation, food, and work. Perhaps the most famous art creations were the three panels of frescoes done by Millard Sheets in 1933. Following the method of "The Italian Masters", Mr. Sheets crested scenes depicting – The Harbor, The City, and The Farm. The student body raised money necessary to pay the costs. The center panel was ruined by an attempt to preserve it and was painted over sometime after 1941. With the construction of the new building, the remaining panels were concreted and painted over. The panels occupy the exterior north wall of the auditorium. Contact has been made with the Mr. Sheets to see if they can be restored. The L.A TIMES art critic at the time stated that – "These artists will go and paint other and finer frescoes in Southern California. In the meantime, South Pasadena has these beautiful art treasures, and someday, when the world pay him tribute, you may say that it was here that he began." As recently as March 1975, Millard Sheets felt that these frescoes were the most beautiful in Southern California. As our new building made possible the addition of more classrooms, etc., the fountains, paintings, grounds, and art of the heritage of the "old" school disappeared. In 1930, G. Derwood Baker, in outlining the aims and guiding purposes of the school state that – "In thinking of the future, most of us envisage a state that is more beautiful, and a citizenry that is more appreciative of the fine and artistic things than the present generation of adults. . . . . Our junior high is attempting to cultivate the tastes and enlarge the cultural interests and creative capacities of the children that come under its care." If the future is now, perhaps we still have a long way to go in appreciation. However, in reviewing the heritage of this junior high, it is evident that it was not just put up because it was needed as the only junior high school in town. More than that, it was created from the spirit that education was important. It related strongly to the fact that children live a major part of their lives in school and the education therein must be of value. To broaden the philosophical and practical aspects in the life of this particular age group, the adolescent with all his peculiarities and sensitivities was accepted as a major challenge. In this Bi-Centennial Year, then, let us look at our school history. It is a fine one for a unique school. During the coming year, as Mr. Rightmar, faculty members, students, and community members help us bring the history of the new building up to date, let us regenerate our direction and enthusiasms to insure that we continue to offer "something of value" to the students, faculty, and community.